"One flower that I really love and have been wanting to make for ages is the wallflower and recently I devoted a while to working out a way to make one. It involved painting the tissue paper, punching out flower shapes and then adding shading to each individual blossom. 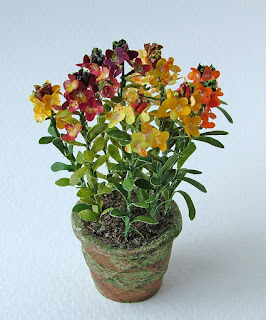 After that was complete, I had to make the tiny buds which cluster around the top of each stem. 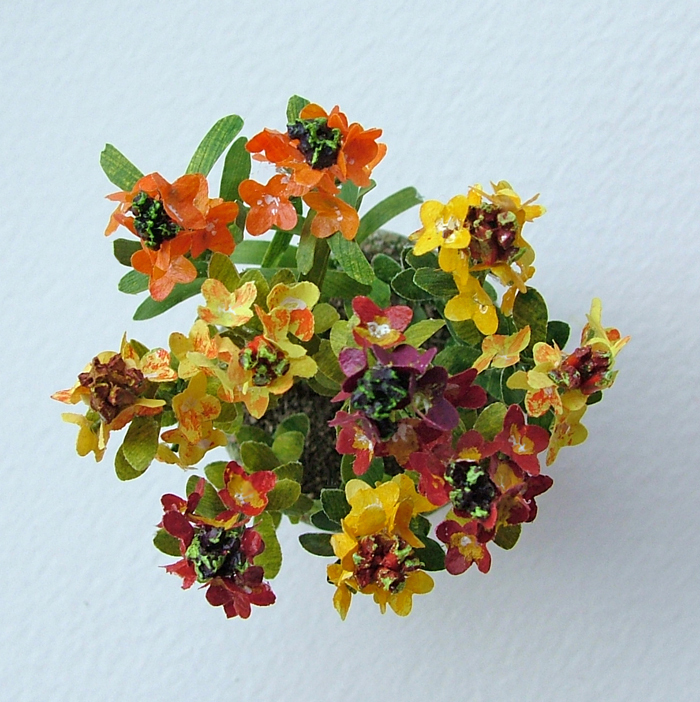 Each stem has leaves growing all the way up; these needed to be cut and punched from painted paper. Then the was a lot of wire and glue! 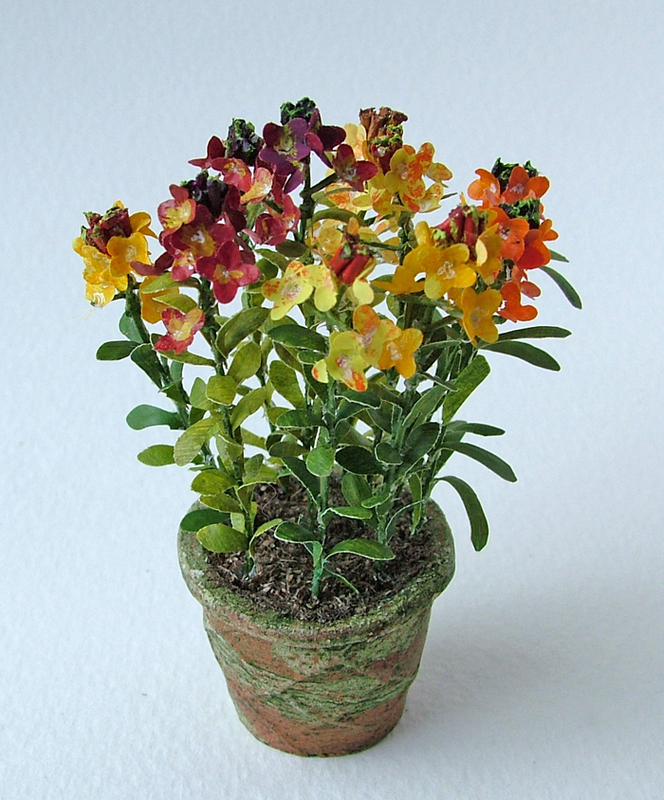 And finally, a micro tip pen to indicate the stamens in each flower head! I'll leave you to decide if I managed to achieve the realistic effect aimed at!" Due to constant requests from customers to expand the range of existing doll’s house scale firescreen designs, and include matching designs for other items in her range, Janet has just launched these four firescreen kits. They are to be stitched in needlepoint on 32 count silk gauze (counted from a colour block chart), with one strand of Anchor cotton. Everything you need is included in the kit – even the white metal firescreen, which comes as three parts and simply needs to be glued together and then painted. 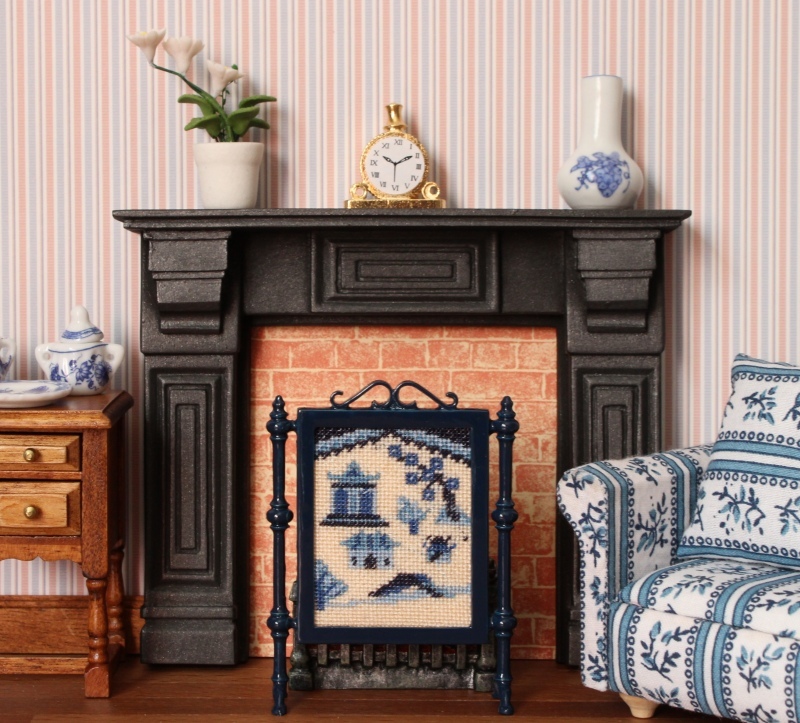 Choose from a willow pattern motif, a classic tree of life, a stunning Berlin woolwork design in black and gold or a floral design with a green trellis background. If you haven’t stitched in this scale before, or would like to know more about what making one of these kits involves, why not have a look at the FREE ONLINE TUTORIALS at www.janetgranger.co.uk/tutorials.htm and see how easy it is to create one of these! The kit costs £19.95. P&P is £1.75 per order in the UK (£3.50 overseas). You can pay using VISA, Mastercard and Paypal (online only), or you can make your cheque payable to Janet Granger if ordering by post. 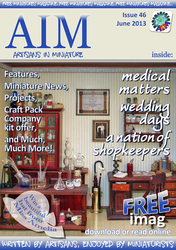 With AIM members bursting to share with you their knowledge on miniature weddings, shop keepers and medical matters, alongside projects and competitions, this issue is yet another not to be missed miniature treat. So why not grab yourself a cuppa, curl up in your favourite armchair and enjoy the 46th issue of the AIM iMag! !